Now that the reading period for our first themed issue is open, we thought that our return to regular Friday Prompts would be a great opportunity to provide you with some inspiration. To that end, we’ll be setting aside this month’s prompts to illustrate just a few of the many approaches with which we believe the theme of “hybridity” could be interpreted. This week, our focus is on form. Although there are many ways in which the formal structure of a poem could cause it to be classified as “hybrid,” for today’s prompt, we’ve chosen to highlight two poems that make use of hybrid forms very differently: Kimiko Hahn’s villanelle “The Fever” (from The New Yorker), which mixes elements of free-verse with the constraints of a traditional formal structure, and Ching-In Chen’s poem “Fob” (from Tea Party), which blurs distinctions between “forms” from different genres by shaping itself around the structure and syntax of a dictionary definition. 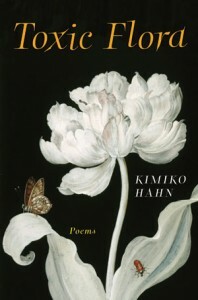 In re-envisioning the villanelle, Hahn holds rhyme and meter loosely. Her use of slant rhymes (e.g. “color” / “fever”) and strategically varied refrains, and her light adherence to iambic meter allow her to engage the “rules” loosely enough that her language flits conversationally from line to line (clusters of Latinate words—themselves borrowed from the science section of the New York Times—as in, “damages the membrane of symbiotic algae,” help to make the stresses sufficiently “bumpy” so as to feel uncontrived), but she still holds onto enough of the form that as the poem rolls along, it stays—like a marble rattling through a chute—recognizably within the scaffold of a villanelle. The lyrical lilt that the form lends to the poem allows it to take on a twinge of ironic whimsy (given the gravitas of its overarching metaphor), while still retaining the appealingly confessional tone that is more frequently associated with free verse. As a result, the voice of the speaker comes across as sympathetically quirky, bemused, worldly—and we wholly buy the “leap” the poem takes when, by its end, we find that the speaker’s musings on coral reefs are merely a conceit by which to critique her own practices of self-ornamentation (“the ocean’s escalating fever” becomes “my ocean’s escalating fever”). Ching-In Chen’s “Fob,” meanwhile, engages in a different kind of formal experimentation: it “borrows” the structure of a type of writing that falls entirely outside the genre of poetry. In appropriating the definition as a poetic form, Chen makes strategic use of the didactic—even alienating—editorial qualities that we associate with the dictionary’s language in order to frame and enact her ensuing critique of the relationship between structural and linguistic hegemonies. Her “example sentences,” which extend the reader’s gaze beyond the bars of the “definition” text to offer startlingly intimate glimpses into an alternate, more evocatively “definitional” narrative, subvert the bland, instructional tone of the dictionary’s text, thus “fobbing” our expectations of the poem’s own conceit. 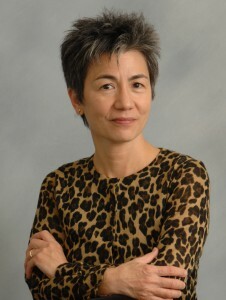 Through her lyric interventions, Chen allows us to witnesses the complicity of teacher and dictionary—by their silence on the pejorative meaning of “fob”—in the racial bullying that the speaker experiences, and gives us access to her subsequent, delicious revenge, in which she tricks one of the bullies into thinking that, among other things, the Chinese word for “ugly” is actually the word for “pretty,” and that the term “ku-li” (coolie) is a flattering and desirable nickname. 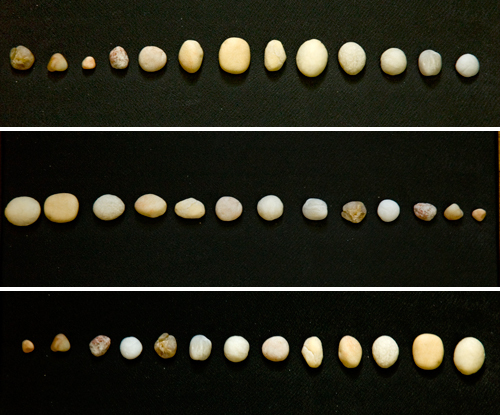 In re-appropriating the dictionary’s syntactical patterns as a “form,” then, Chen successfully manages to turn the cultural and linguistic authority it represents against itself. Prompt: write a poem that makes use of hybrid form, either by blending a traditional form with new and unusual elements from other verse traditions, or by appropriating the “formal” conventions of another style of writing or genre. The submissions period for Issue 5, “The Hybridity Issue,” will close on July 15th. Has this prompt inspired you to experiment with hybrid forms in your writing, or do you have previously unpublished work that explores the concept of “hybridity”? Click here to submit. Weekly Prompt: Ordering, Reordering, Reversing. As I’ve been working on coding, laying out, and putting together Issue 3 (which in many ways has proven to be a much more technically challenging endeavor than our previous two issues), the question of order/ordering has continually been at the forefront of my mind. How important decisions about order are when presenting a group of poems, or images! Juxtaposition means everything: placing even one small poem strategically can entirely change and elevate the overall energy of an issue, an anthology, a collection. And (to apply this thought to the level of craft) how much more so with regards to the arrangement of lines, images, stanzas, within each poem itself! 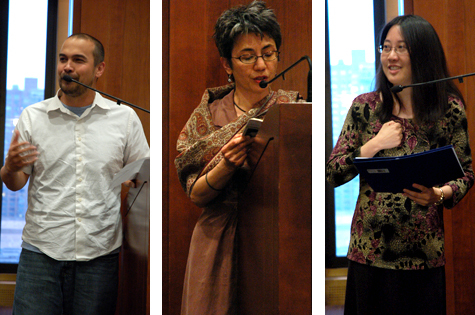 At this year’s Kundiman retreat, Oliver de la Paz showed me how the placement of a single poem within a manuscript would affect the impact with which certain images in it would be perceived by a reader—and that revising with attention to order, both on a inter-poem and intra-poem level, was therefore very necessary. And during workshop, Kimiko Hahn suggested that one of the Fellows try reversing the order of the lines in her poem, a simple change that which—when applied, completely reshaped its arc, and brought the whole piece alive in a new and fascinating way. Of course, reversing the order of a poem’s lines does not work the same magic in every case—it worked on the poem that we were discussing because it allowed the strange linguistic impulses of the final lines to speak better and thus made the arc of the new version much less tidy and more texturally interesting. But the results of this simple revision exercise got me thinking about how to apply it to my own writing. How many times have I shuffled and reordered stanzas in a poem that feels stuck, only to find that the arc of the poem was still either falling flat? Oftentimes, my last thoughts as I draft a poem may be some of the most complex, the most evocative, and so reversing a poem, image by image, or even line by line, could be a very useful way to at least read the images in the draft from a different angle, and thus to reenter the revision process on a fresh foot. Today’s prompt is an example of more shameless, deliberate “stealing” from the advice of teachers whom I admire. Prompt: Take a poem whose arc or movement feels “stuck” and reverse the order of the images or lines as way to re-envision the “map” of the poem. Alternately, if you are working on a manuscript, try reversing or changing the order of poems, or experimenting with reversing lines within the opening and closing poems to see whether the impact of this reordering reveals anything new and luminous. On the subject of "stealing" poems from the observed world: a "steal-worthy" orthographical variation? 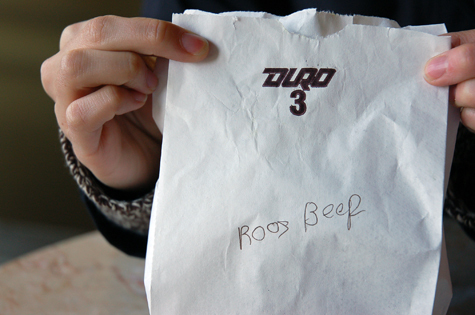 (Bag reads "Roos Beep"). Today’s exercise is less of a prompt and more of a practice, but having just returned from the 2011 Kundiman retreat—at which Oliver de la Paz announced on the first day that he fully intended to “steal” from each of us, and where Kimiko Hahn shared a lovely collaborative variation of a “stealing” exercise during my final workshop of the weekend—I wanted to continue the chain and extend the same thought to you. Perhaps the term “stealing” is a bit harsh-sounding—”recycling,” “quoting,” or “riffing” might be more a more genteel way to put it, since what it involves is not outright plagiarism, so much as a process of exploring new avenues through “sampling” and strategic mimicry—but somehow it still feels apropos, as the delightful discovery and surprise that occurs when one takes something that one admires and puts it into a different context, tinkers with it, uses it as a launching pad or a frame, embeds it, or layers it with one’s own work, does in part come from the feeling that one is doing something utterly subversive. Socially and culturally, we tend to envision the artist as a lonely figure who operates entirely self-sufficiently—the work, and its every element, must come out of her head and her head alone. But in fact, in our daily lives as artists, we are engaged in a perpetual process of “stealing”: we observe things in the world around us—the quality of light on a bedspread, the deep crease in a parent’s forehead, the conversation between a pair of girls at a nearby table, the color of a house, what the host is saying on TV, the sound a cash register makes when it opens, the texture of a wall at the train station, the funny taste of food when one is sick, a joke that fell flat at a party—we process them, we file them away, and these things which we file away filter themselves, eventually, into our creative work. 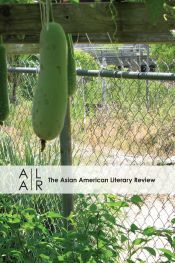 In Gerald Maa’s interview with Arthur Sze in this issue of the Asian American Literary Review, Maa quotes from Auden: “Many things can be said against anthologies, but for an adolescent to whom even the names of most of the poets are unknown, a good [anthology] can be an invaluable instructor.” The same can be said of this 300-page journal, with its wide range of material including: a forum discussion with some of the editors about the “check all that apply” race option on the 2010 Census, an enclosed DVD of Kip Fulbeck’s video short Mixed: Portraits of Multiracial Kids, and a complete bibliography of Carlos Bulosan provided by the Library of Congress’s Asian American Pacific Islander Collection. This is all in addition to fiction, memoir, poetry, interviews with Arthur Sze (on editing Chinese Writers on Writing) and Chang-rae Lee (on his most recent novel, The Surrendered), book reviews, documentary photography, and a short graphic piece. To write a haiku or a ghazal in English does not bring us any closer to shifting the grounds of literary representation. In Yang’s memorable formulation, such a literary gesture would fail to “reposition the frame structure.” Rather, our formal labor [as Asian American writers] has to occur beyond the frame, in the abstract conceptual space where form is given particular shapes suited to the particular historical moment. Workshop has become my favorite class. Maybe because I genuinely enjoy reading other people’s work and sharing my own. Maybe because the literary critic in me likes playing with the writer, or maybe it’s because on day one, my new piece, “The Red Frame,” caused some controversy. There’s nothing like starting off by making waves! What is my life concept? What is my story? I need a new frame, but I don’t know the old frame. Two students got into an argument about who the audience of the piece was, why it provided no answers, and what was going on in general. Two students argued, but the class itself was split in their views pretty evenly down the middle: one camp loved it, the other was confused. To the people who asked who the audience is and what the conclusion, or the answer, was, I didn’t respond because it doesn’t matter what my answer may be. It’s about their answers, and their answers were all valid. The piece is schizophrenic. It’s disjunctive. It wants to be dark and dwell on its darkness. It is, and I say this as objectively as possible, beautiful. Ultimately though, it is whatever the reader wants it to be. I come from the school of the Language poets . The point is to play with conventional literary structures, language and ideas to find out what the reader brings to the table. Our instructor told me that she thinks what was really going on in workshop was that the students were discovering what was essential for them in their own writing. It’s a great question: what is essential for you in writing? For me, it’s structure and imagination. Structure because organization is essential for framing the theme, and imagination makes it beautiful. Both create a worldview. 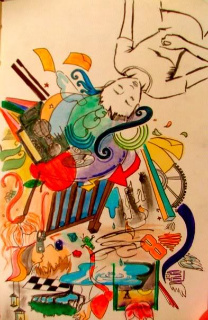 In college, I spent a good deal of time searching for a form that felt both: natural and imaginative, lyrical and concise, fragmented yet whole. 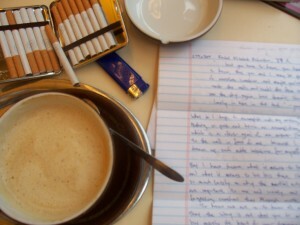 I love essays but couldn’t find an organizing principle to make them work. I like prose poems, but thought them too suppressive at the time. I wanted to sprawl and sing across the page! Sonnets, villanelles, and iambic pentameter are all great… when written by other people. Let’s face it, I’m lazy. I’m also tone deaf. But most importantly, I needed a form that was dialectical, not just in its content, but in its very structure. I wanted organization to mirror self-expression, which required a form that uses dialogue, process and contradiction. Why contradiction? Why dialectics? As political Asian Americans, we cringe at the East vs. West binary because our very existence (as Asian Americans) contains both. It’s an old, false construct, and yet, as a Korean adoptee, nothing else encompasses my lived experiences. By “lived experiences,” I mean the dichotomy of being born in Pusan and being raised as a white American, being told I’ve been chosen by my family and being told I’ve been given up by my family, or being told how much I am loved because one set of parents wants me so much they won’t let me go and being told how much I am loved because one set of parents loved me so much that they let me go. What sort of form allows such paradoxes to be beautiful and not messy? What sort of form allows such paradoxes to be messy and still beautiful?